When the great Vin Scully puts his golden tonsils to work for the Opening Day of baseball season in Los Angeles this Monday, he will be tacking yet another year on to this city’s long tradition with our national pastime. Believe it or not, there was a night game in Los Angeles on July 2, 1893, even though Major League baseball did not follow suit until 1935. Dogged baseball historians—as resolute a group of researchers as any—have tried to determine the location of that game by studying a microfilm reader; even so, the host park has remained elusive. Enter this old gem of a map. On the cartogram above, Athletic Park is clearly seen on Alameda Street between 7th and Palmetto, very near to the spot where a Greyhound bus terminal and a McDonald’s stand today. Back in the 1890s, the Los Angeles Athletic Club utilized the space by building a field with a double-deck grandstand that seated 1,500 and bleachers that took in several thousand more. The project seemed like common sense what with Southern California’s temperate climes providing perfect baseball weather. While the Athletic Club used Athletic Park for all manner of sport (lacrosse, football, track), it became the home of the California League’s Los Angeles Seraphs, who became the Los Angeles Angels in 1893, where they competed against the Oakland Colonels, the Sacramento Senators, the San Francisco Friscos (honest! ), the San Jose Dukes, and the Stockton River Pirates. Equipment was rather primitive, with fielders’ gloves looking like thick gardening gloves, but the catcher’s mitt was actually patented in 1893. Admission was .50 cents, a far cry from today’s box office gouge (which starts at $11 and tops out at an astronomical $900 per ticket) at Chavez Ravine. In 1892 and 1893 the Angels played an odd split schedule, hitting the field beginning in March and playing through July 4 after which they took a break and started up again in late summer. In an attempt to build a fan base, “Ladies Day” was held once a week; in one amazing game, 500 women showed up to watch their home team thump San Francisco 10-5. The most memorable game at Athletic Park was, however, the aforementioned night game, which used electric light to slightly illuminate the dirt field. The first pitch was thrown at 9 p.m., and assorted musicians played throughout the game. The umpire took his position behind home plate and held the leash of a bulldog while he called balls and strikes. Some batters came to the plate with broomsticks or umbrellas, and, at one point, a gent ran to third from home after hitting a pitch. The game was interrupted when the bulldog caught a ball in his mouth (it took some time to remove it before the game continued). When it was all over, the Angels “won” 5-2 over Stockton. The evening concluded with a potato sack race. After 1893, the California League ceased competition until 1898, but by that time, the action had shifted to Fiesta Park at 12th and Pico. 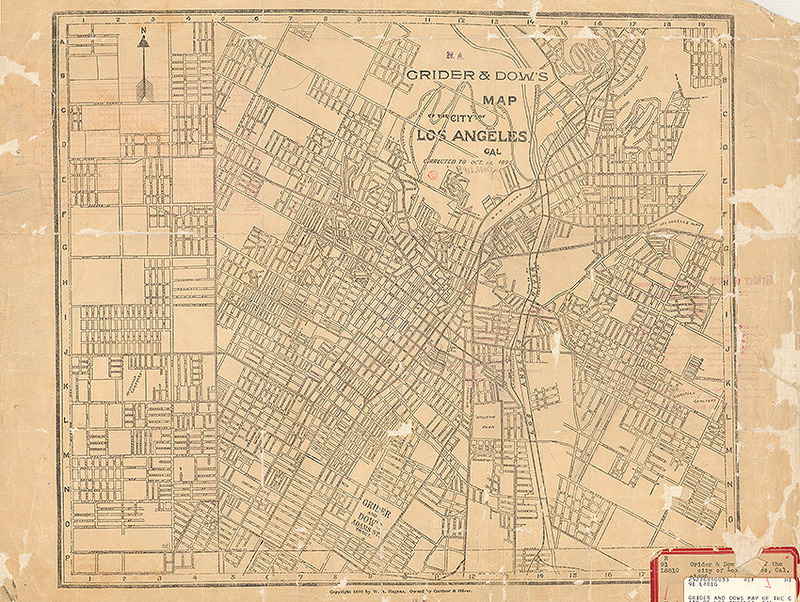 Mapmakers Leroy M. Grider and Wilbur O. Dow were prominent real estate agents who published maps of the city to accompany city directories and other guides. 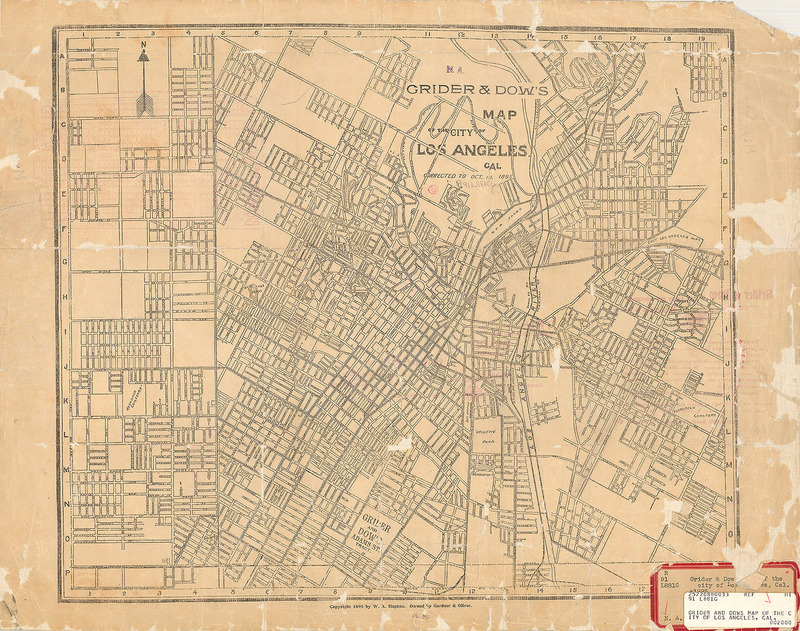 This rather crisp one almost traces the old Four Square leagues of the original city lands, including that perfect rendering of the western boundary at Hoover Street.